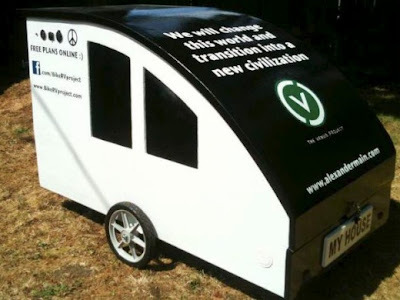 Okay, this takes the tiny house movement to a whole new level. 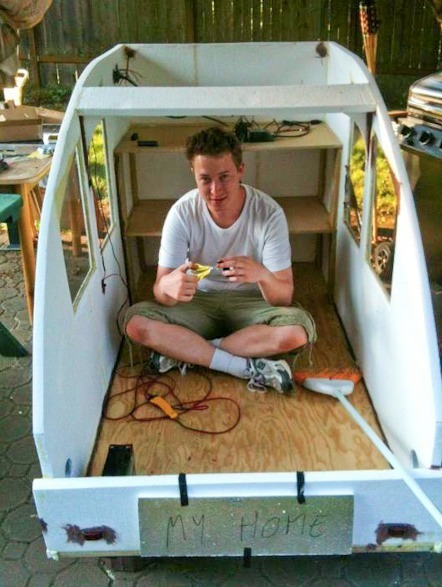 That's Alexander Main in the above photo in the midst of building his bicycle RV, which he now lives in. When he parks it at night he refers to it as "lawn surfing" (nice). Here's a picture of the finished RV below. While I am always trying to simplify and downsize I am not sure I am ready for this...but I am really interested in it. I've often thought that if I were homeless (and maybe I will be someday) I would want to own a bike for easy transport, but it would be even better if I had one of these mobile shelters (a tent on a trailer by Tony's Trailers). They are inexpensive and could carry all your stuff. Anyhow, for examples of more deluxe options of mobile shelters (most of which are made by the people who occupy them) click here, here, here, here, or here. To visit Alexander's Bicycle RV website, click here; if you'd like to donate to or support his project, click here. Here's a short video explaining his trailer.